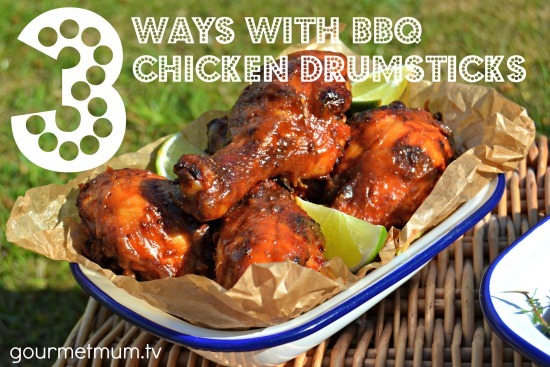 Chicken Drumsticks are inexpensive, readily available and perfect for BBQ's and picnics. With a few simple ingredients, and very little time, you can transform this humble cut into a feast. 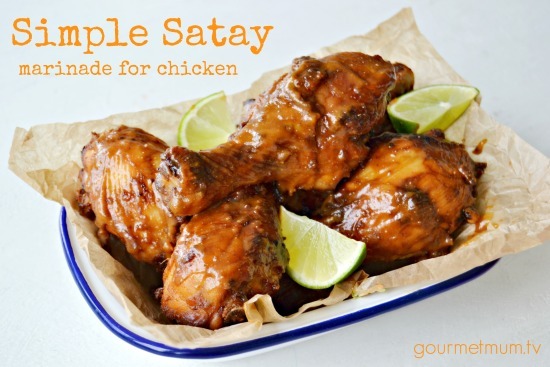 Here's three delicious easy marinade ideas for chicken - simple satay, honey & mustard and lemon & thyme. I much prefer cuts of meat on the bone such as chicken drumsticks and thighs. The meat has more flavour, it's more juicy and it's less likely to dry out on a BBQ. If you are worried about cooking chicken on a BBQ, roast it first in the oven and finish it off over the flames to the that smoky flavour. To get best results cooking chicken on a BBQ, use a medium to low flame to ensure the chicken cooks thoroughly and evenly. Choose boned cuts instead of the breast and leave the chicken skin on to protect the meat and keep it moist. To check it's cooked, insert a skewer into the thickest part of the meat. When the juices run clear it's cooked. Mix all the ingredients together until smooth. Rub the chicken drumsticks with the marinade, over and under the skin. Leave to marinade for at least 30 minutes but preferably overnight. Place in a greased baking tray and roast in a pre-heated oven at 190 C / 170 fan / gas mark 4 for around 30 minutes or until the juices run clear when a skewer is inserted into the thickest part. Turn once half way through cooking. Alternatively, grill on a BBQ. Mix the honey, mustard and seasoning together and rub all over the chicken drumsticks including under the skin. Leave to marinade for at least 30 minutes but preferably overnight. Mix the ingredients together and rub all over the chicken drumsticks. Push some of the marinade under the skin as well. Leave to marinade for at least 30 minutes but preferably overnight.